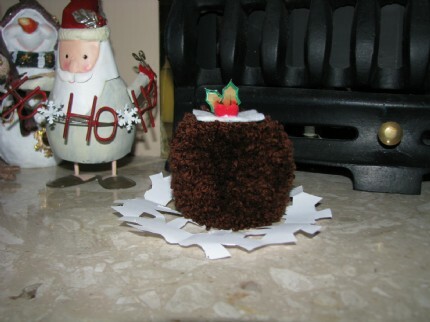 A great little Christmas table decoration, a fluffy pompom Christmas pudding! 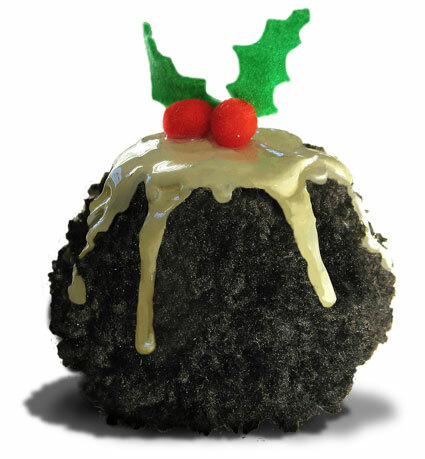 Christmas pudding is a steamed pudding, heavy with dried fruit and nuts, and usually made with suet, but in this case you'll be cooking up with a bundle of wool... interesting. It is very dark in appearance - effectively black - as a result of the dark sugars and black treacle in most recipes, and its long cooking time, but all you need for this pudding is some black or very dark brown wool and about 20 minutes.
. . . Traditionally, Christmas puddings were boiled in a pudding cloth, and they are often represented as round, a classic pudding shape which is just about perfect for this great looking, easy to make Christmas decoration. Don't forget the pud is traditionally topped off with a sprig of holly, you can make yours from felt, using beads or mini pompoms for the berries.
. . . Pompoms are easy to make and suitable for boys and girls who’ll love this sort of activity.